When is the 2019 Assaults on Mt. Mitchell and Marion? 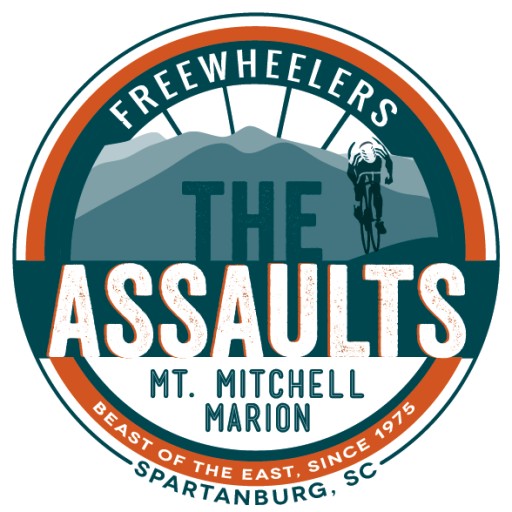 When does registration close for the 2019 Assaults? Online registration closes on Friday, May 17 before the ride. Cyclists can register in person Sunday before the ride during Packet Pick-Up. Packet Pick-Up is 1 p.m. – 8 p.m. at the Spartanburg Memorial Auditorium on May 19. There will be no registrations on May 20. Is there any Safety and Training information available? Click here for safety and training information! Why is the event held on a Monday? Due to the popularity of both the Blue Ridge Parkway and Mt. Mitchell State Park, Monday is the only day available for a special event of this size! Why are family/friends/personal SAGS not allowed to follow riders on the course? Why can't they drive to Mt. Mitchell to watch the rider finish? In order to keep the course safe, and to not cause additional traffic concerns, family/friends/personal SAGS are not allowed to follow riders. The spectators’ guide contains information about how you can cheer on your rider at key points on the course! Due to safety concerns, family/friends/personal SAGS cannot drive to Mt. Mitchell. This is a policy set forth by the Blue Ridge Parkway and Mt. Mitchel State Park that we must adhere to. If you would like to see your rider finish at the top of Mt. Mitchell, you will need to purchase a spectator bus ticket from Marion to the top of Mt. Mitchell for $15 online here. In 2018, All those parked along the route in undesignated spectator areas will be turned away by ride officials, police and parkway officials. Those with SAGS on the course will be immediately disqualified from the ride, and not given a finishing time and removed from the finishers list. If a rider needs help many volunteer techs, SAGS, and Marshals will be on the course. Are there entry requirements to be able to ride the Assault on Mt. Mitchell? There is no set timing requirement to register for The Assaults. Please note that this course is very challenging and requires proper training to ensure the safety of the rider! You may transfer your registration to another rider, if you are unable to participate. Transfers may be made until Wednesday, May 8, 2019. A $30 transfer fee is charged to the new rider upon transfer; it is up to the individual parties to set and collect any amount outside the transfer fee. If a participant wishes to transfer their registration to a different participant they can click on ‘Edit’ under their entry and choose ‘Transfer Registration’. Here they will be prompted to enter in the email address of the person receiving the transfer and click the button again. I am no longer able to participate. Can I get a refund? The Assaults is unable to offer refunds OR deferments to the following year. You may be able to transfer your registration to another rider for an amount agreed-upon privately between riders, plus a $30 transfer fee. BikeReg, who hosts the event registration offers a third party ride insurance through Allianz that can be added to your event purchase on your own accord. If you purchased this and would like to make a claim please head to https://www.eventregistrationprotection.com/ to make a claim. NOTE: THE ASSAULTS ARE IN NO WAY RESPONSIBLE OR INVOLVED IN INSURANCE DISPUTES. If you don’t have your policy number, you can click “Don’t have your policy number?” and enter your email and the event date (May 20, 2019) to proceed. How does one train or prepare for events as arduous as these? We recommend researching training plans for century rides, which include hill training. When is 2019 Packet Pick-up? On Sunday, May 19 before the ride at the Spartanburg Memorial Auditorium. From 1:00 – 8:00 p.m., you can pick up your packet and enjoy an expo with local companies all supporting The Assaults. You will be able to put a small dry clothes bag onto either the Marion or Mt. Mitchell truck. Additionally, you can pick up your packet on Monday morning of the ride at the auditorium from 5:45 – 6:15 a.m. You will again have the opportunity to put a small dry clothes bag onto the appropriate baggage truck. May I leave my car in Marion on Sunday? If I drop my car off on Sunday will there be a way for me to get my luggage to Marion on Monday? You may drop off a small duffle bag on the appropriate baggage truck on Monday morning between 5:45 a.m.-6:15 a.m. The Assaults does not provide any personal luggage transportation beyond that one small bag. Are there any special room rates at local hotels? When should I purchase my transportation ticket(s)? Transportation tickets can be purchased at any time during the online registration period or at packet pick-up the day before the ride. What is the start going to be like this year? In an effort to create a smoother smart, we have asked participants to estimate their average speed time. We would appreciate riders lining up according to those times at the start of the ride. How many Rest Stops are on this course? There are ten total rest stops along the ride to Mount Mitchell. There are four rest stops before reaching Tom Johnson Campground and the finish of The Assault on Marion. Please reference the cue sheet to see the exact locations. What will be available at the rest stops? Rest stops offer food, beverage, first aid kits and toilets. SAG vehicle will also be available on the course. Some rest stops will have tech support available as well. Please reference the cue sheet for more information. Are pets allowed on the bus, or throughout the course? No pets are allowed. Service animals specifically trained to aid a person with a disability are welcome. Pets will not be allowed at the start line in Spartanburg, or finish line in Marion and Mt. Mitchell. Pets will also not be allowed on the Spectator Bus. What time does the ride end? Cyclists must pass the finish line at Mt. Mitchell by 5:30 p.m. Those that do not finish in time will be picked up and taken to the closest bus point. What if I don't finish the ride or make it to the top? If you are not able to complete the ride by 5:30 p.m. or unable to complete for another reason, an officially marked Assaults vehicle will pick you up and take you to either Marion or Mt. Mitchell depending on proximity. If your dry clothes bags are not in the same place as you, we will do everything in our power to get you your items in a decent time, but there is considerable travel time from Mt. Mitchell to Marion and due to narrow roads on Mt. Mitchell limited vehicles and baggage trucks are able to pass at once. I am coming from out of town, how should I plan my travels? Due to nature of this ride, we recommend that you have flexible travel plans. We do our best to get everyone off the mountain and reunited with their bikes in the correct place as best we can. Due to limited communication, small roads and travel times moving bikes and people can have delays. Please do not make plans to fly the same day or other important plans for that night or the next day. It is a long ride across a long distance. I would like to help! How can I volunteer? Every year The Assaults has over 300 volunteers help with the ride. To join, please email taegen@startflourishing.com or fill out our Google Form here. What do I need to bring on the ride? Cyclists should have a helmet, a flashlight (unlit tunnels on the route), any specific food items you like, and a water bottle that can be refilled. Once you reach the top, cyclists will need to remove any valuable items from their bikes like GPS, cell phones and packs. May I drop a dry clothes bag off to be transported to the finish line? You may pack a SMALL duffle of dry clothes and place it on baggage trucks during Packet Pick-Up on Sunday or Monday morning. Plastic grocery bags are also a great option. Cyclists can drop a clothes bag off Monday, May 20 from 1 p.m – 8 p.m. or Sunday morning until about 6:15 p.m. when trucks are locked up. Please tag your bag with the provided luggage tag (included in your packet) and place it on the appropriate truck. Due to the potential for damp weather, consider wrapping your clothes first in a trash bag or large ziplock, then place in your duffle. DO NOT place car keys or any valuables in your dry clothes bag. In the past, riders have been separated from their clothes (and keys) when they are ready to go. We cannot be held responsible for lost or stolen items. NOTE: If you are unable to complete the ride, we will work to get your bag transferred off the mountain to Marion on one of the incoming bike trucks. Please expect a delay in receiving your bag.